Another new widespread and disastrous SSL/TLS vulnerability has been uncovered that for over a decade left Millions of users of Apple and Android devices vulnerable to man-in-the-middle attacks on encrypted traffic when they visited supposedly 'secured' websites, including the official websites of the White House, FBI and National Security Agency. Dubbed the "FREAK" vulnerability (CVE-2015-0204) - also known as Factoring Attack on RSA-EXPORT Keys - enables hackers or intelligence agencies to force clients to use older, weaker encryption i.e. also known as the export-grade key or 512-bit RSA keys. FREAK vulnerability discovered by security researchers of French Institute for Research in Computer Science and Automation (Inria) and Microsoft, resides in OpenSSL versions 1.01k and earlier, and Apple's Secure Transport. Back in 1990s, the US government attempted to regulate the export of products utilizing "strong" encryption and devices were loaded with weaker "export-grade" encryption before being shipped out of the country. At that time, it was allowed a maximum key length of 512 bits for "export-grade" encryption. Later in 2000, with the modification of the US export laws, vendors were able to include 128-bit ciphers in their products and were able to distribute these all over the world. The only problem is that "export-grade" cryptography support was never removed and now three decades later, FREAK vulnerability make it significantly easier for hackers to decode the website’s private key and decrypt passwords, login cookies, and other sensitive information from HTTPS connections. HOW FREAK VULNERABILITY WORKS ? In the client's Hello message, it asks for a standard 'RSA' ciphersuite. The MITM attacker changes this message to ask for 'export RSA'. When the client encrypts the 'pre-master secret' to the server, the attacker can now decrypt it to recover the TLS 'master secret'. A scan of more than 14 million websites that support the SSL/TLS protocols found that more than 36% of them were vulnerable to the decryption attacks that support RSA export cipher suites (e.g., TLS_RSA_EXPORT_WITH_DES40_CBC_SHA). Cracking a 512-bit key back in the '90s would have required access to supercomputers of that time, but today, it can be done in seven hours and cost nearly $100 per website only. It is possible to carry out FREAK vulnerability attack when a user running a vulnerable device — currently includes Android smartphones, iPhones and Macs running Apple's OS X operating system — connects to a vulnerable HTTPS-protected website. At the moment, Windows and Linux end-user devices were not believed to be affected. FREAK vulnerability is similar to last year's POODLE flaw or Padding Oracle On Downgraded Legacy Encryption, which allowed hackers to downgrade the entire SSL/TLS Internet-communication security suite to the weakest possible version. FREAK affects only those SSL/TLS implementations that accept export versions of protocols that use the RSA encryption algorithm. Security researchers are maintaining a list of top vulnerable websites and encourage web server administrators to disable support for export suites, including all known insecure ciphers, and enable forward secrecy. You can also use an Online SSL FREAK Testing Tool to check whether a website is vulnerable or not. Google said an Android patch has already been distributed to partners. 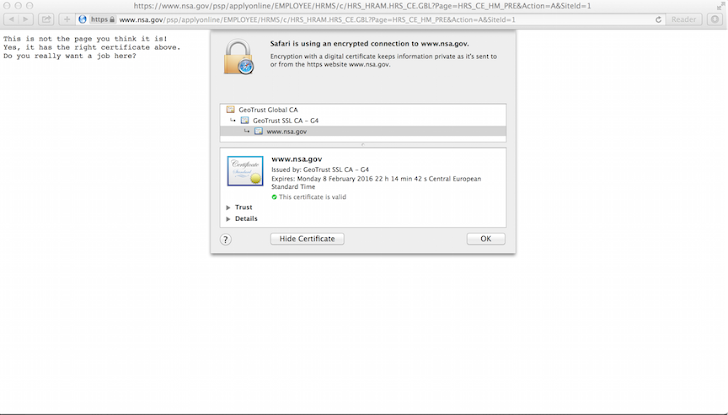 Meanwhile, Google is also calling on all websites to disable support for export certificates. Apple also responded to the FREAK vulnerability and released a statement that, "We have a fix in iOS and OS X that will be available in software updates next week."